The years 1852-53-54 proved to be the consecutive years that three American steamships named Independence were destroyed with loss of life. Two were destroyed by fire and explosion. 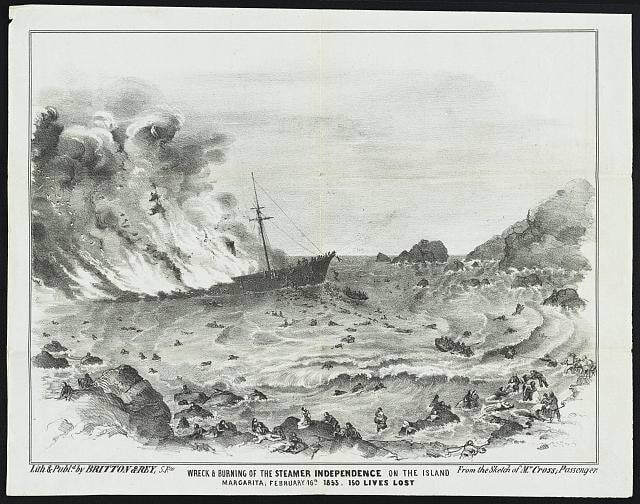 Over 150 passengers and crew members perished when the steamer Independence went aground on Maryetta Island, California on February 16, 1853. Another seven persons died when the boiler exploded, destroying the propeller Independence near Sault Ste. Marie, Lake Superior, on November 22, 1854. Both ships were among the new breed of early steamships that were beginning to replace sailing ships on the world seas. Both were wooden hulled vessels with early and unpredictable steam powered boilers that were responsible for the disasters. An untold number of passengers and crew members perished when a steamship named Independence stranded in shallow water in high seas on the Gulf of Mexico, while making passage from New Orleans to Galveston on April 26, 1852. Most died when their lifeboats capsized while battling a heavy surf and attempting to reach a nearby shore. Some survivors were rescued by other ships that pulled alongside before the steamer broke up. The California disaster was the most deadly of the three. This Independence was carrying about 500 passengers when it ran aground on Maryette Island. The engine room crew ran the engines in reverse and managed to back off into deep water, but then it was discovered that the ship’s hull was opened and the vessel was sinking. Captain Sampson ordered the pilot to run the steamer back on the beach. In the meantime the overheated boilers exploded and started a fire that quickly spread through the ship. The passengers attempted to escape the burning ship either in lifeboats or just diving overboard and attempting to swim to the shore, which was about 300 yards away. Many swimmers were carried by the current out to sea where they drowned. Those who reached shore found themselves on an uninhabited island without food or water. They suffered there for 56 hours before they were rescued. The final Independence disaster occurred on Lake Superior after the vessel, under the command of Captain John McKay, was just beginning a late autumn trip with winter supplies and a few passengers bound for Ontonagon and La Point. About an hour after leaving the dock at Portage, Michigan, the boiler exploded, instantly killing the engineer, two firemen and one passenger. Others later died from burns sustained in the blast. Some passengers were literally blown off the ship and into the water by the explosion. That the death toll on the Lake Superior explosion was so low was regarded as a miracle. One crew member was thrown over a thousand feet into the air and lived to tell about it. Captain McKay survived and went on to command several more Great Lakes vessels. He was well known among the Great Lakes skippers.